Before we begin the configuration, we need to enable IPv6 packet forwarding with ipv6 unicast-routing, the IPv6 version of Cisco Express Forwarding (CEF) with ipv6 cef, and the OSPF v3 process with ipv6 router ospf. If you don’t have any IPv4 addresses configured on the router, you must configure an OSPF RID with the router-id command. OSPF v3 interfaces are placed into areas at the interface level. To see more details about the neighbor, run show ipv6 ospf neighbor detail. The output is just a little different than OSPF v2. show ipv6 ospf interface and show ipv6 ospf database. The first command shows the link-local address of both the local router and the BDR (R1). The second command indicates the use of OSPF v3 in the output almost immediately. The IPv6 equivalent of OSPF IPv4’s show ip ospf is show ipv6 ospf. This command also indicates the use of OSPF v3. We need to enable a Cisco router’s IPv6 routing capabilities with ipv6 unicast-routing. During an IPv4 to IPv6 migration, you may run OSPF v2 and OSPF v3 side by side. In IPv6, you’re not going to start an OSPF configuration with router ospf. One major difference between v2 and v3 is that v2 is enabled in router config mode and v3 is enabled on a per-interface basis. This will automatically create a routing process. The basic operational theory of v3 is very similar to that of v2. The Hello packet is still around, as are the LSAs and LSAcks. Stub, total stub, and NSSAs are still around, and the Area 0 rule still exists (as do virtual links). The general rules for neighbor discovery and adjacencies are the same. v3 NBMA configurations require neighbor statements, just like v2. One major difference between the two is that v3 allows a link to be part of multiple OSPF instances, where v2 would allow a link to be part of only one. v3 point-to-point and point-to-multipoint configurations do not elect DRs and BDRs, just like v2. v3 headers are smaller than v2, since v3 headers have no authentication fields. The v2 reserved address 224.0.0.5 is represented in v3 by FF02::5. The v2 reserved address 224.0.0.6 is represented in v3 by FF02::6. We can still use the area range command, and IPv6 does make summarisation more effective – but when you use the area range command in v3, the OSPF cost of that summary is simply the highest of the individual route costs. The 128 bits of an IPv6 address are represented in 8 groups of 16 bits each. Each group is written as 4 hexadecimal digits and the groups are separated by colons (:). The address 2001:0db8:0000:0000:0000:ff00:0042:8329 is an example of this representation. This address is equivalent to the public IPv4 address classes. These addresses are fully routable and can be used for Internet access. The word “aggregateable” refers to the ability to aggregate, or summarize, these addresses to make routing more efficient. The range of IPv6 global unicast addresses is 2000::/3 (any address that begins with 001). An address that is kept on the local link. Prefix of Fe80::/10 followed by the interface identifier from the previous post. These addresses were originally designed to be the equivalent of an IPv4 RFC 1918 private IP address. The double-colon is zero compression in action, so now we need to convert the lower 32 bits into decimal. The IPv4 address that was embedded into the IPv6 address is 209.144.78.113. IPv4 multicast addresses are Class D addresses with a first octet value of 224 – 239. Any address that begins with “1111 1111”, or “FF” in hex, is a multicast address — the full prefix being FF00::/8. FF02::1:FFzz:zzzz/104 — Solicited-node address. These are used in Neighbor Solicitation messages – more about these very soon. The “z”s are the rightmost 24 bits of the unicast/address of the node. This is a combination of a unicast and multicast. An anycast address is a unicast address assigned to multiple interfaces. A sender transmits an anycast packet in the same manner it would a unicast packet and when the router receives the anycast packet, the router then sends that packet to the closest device with that anycast address. 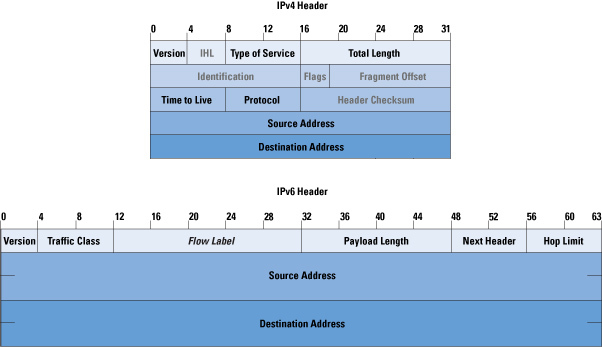 How IPv6 defines what is ‘closest’? It’s the first learned directly connected neighbor – if there are directly connected neighbors. If that’s not the case, it’s simply the closest neighbor as determined by the routing protocol metric.